The rooms, bright and comfortable, are furnished in a typical Venetian style with the greatest attention to detail and include amenities such as air conditioning, satellite TV, a hairdryer, safe, and telephone. Some rooms have private bathrooms while two rooms share a nice bathroom on the same floor. 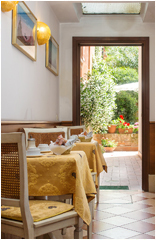 The rooms overlook a charming little garden where, during the summer, we love to spoil our guests by serving a breakfast based on typical Venetian specialties, where guests can enjoy amazing moments of complete relaxation.